The Parish of Saint Lucia is a place of worship of Montenero d’Orcia, village of Castel del Piano, whose construction dates from the twelfth century, as pertaining to the abbeys of San Salvatore and Sant’Antimo. 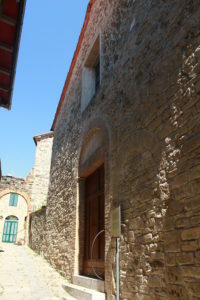 The building of the church of Saint Lucia, Romanesque style, is characterized by a very simple façade, with just a small portal and a square window. Inside it is preserved an altarpiece from the XVIII century with the Madonna of the Rosary with St. Dominic, Anthony, Gregory, Jerome, Apollonia and Catherine of Siena, a painted cross attributed to Ambrogio Lorenzetti (XIV century), the Madonna of Mercy and a ‘font in the seventeenth century travertine.